Ladies, your hassle for buying ethnic wear, casual wear or accessories at one place is over. Presenting you, IndiaRush – it’s a one-stop solution for all your shopping needs. 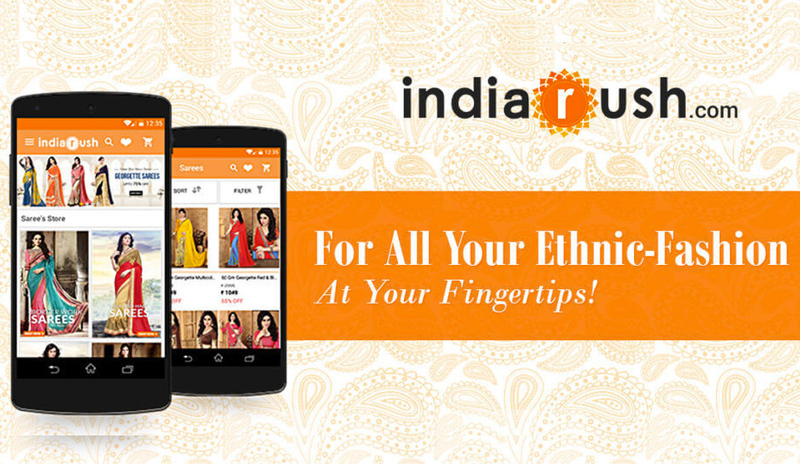 IndiaRush is an online store for ethnic fashion, which focuses on bringing out the latest fashion trends. It is considered to put its level best efforts to reach every house in every corner. Rahi Jain & Arti Sharma (the founders) were deeply fascinated by work done in mixing western and eastern culture with an addition to innovative designs in Indo-Western fashion. The founders had an idea to present these traditional styles to the new younger audience in a more fashionable way, and that’s how IndiaRush was born. The founders have a rich experience in online consumer markets and have worked previously as early team members in One97 (Parent company of PayTm), Ibibo, Letsbuy (acquired by Flipkart), Vodafone, Comviva etc. IndiaRush is playing in a highly competitive B2C E-commerce industry in India, it needed to level up with all existential tycoons. Therefore, along with their e-commerce store, they are also providing its customers a personalized social platform called “Look Book”, shopping BFF section called “Collection”, “Celeb” category to steal styles of celebrities and “Fashion Edits” which provides fashion knowledge and gossips. IndiaRush was launched in July 2012 with a team of 4-5 people. According to the founders of the company, it’s been a fabulous journey so far. They have done GMV of 20 Cr last fiscal year and looking forward to reaching 75 Cr in current fiscal year. They have been gaining around 300-500% year on year growth since its launch. Additionally, they have around 1 Million user base with around 2-3 Million visits for their site on a monthly basis. The company aims to position themselves as one-stop solution for female ethnic wear. There are already top 3 online ethnic stores in India, but the founders are looking to become distant first by the end of this fiscal year. They also wish to focus on Omni-channel retail in future with an offline presence, once they establish themselves online. Additionally, catering to NRIs abroad is also on the plate, but the main focus is aligned with Indian markets as of now. The revenue model of the company focuses on a controlled marketplace model and the team work closely with sellers on their platform from all over India providing PAN India products to PAN India customers. It works on commission model with their sellers and work as a link between buyers and sellers, but they keep it highly controlled as they are the face for the customer. The company is bootstrapped at the moment, and the founders say being bootstrapped is challenging in the current scenario. The company’s competitors include Craftsvilla & Voonik. To outpace them and gain a major hand in the market the company plans on providing one stop solution to all fashion needs. They believe that they are making it more social for the customer, by creating the right network effect and providing a more customized solution. We would advise not to make your plan around external factors like raising funds or over-reliance over single partner (client/account). Try to ‘Build in-house intelligence’ because taking credit and benefit after long is just like late night piece of cake. What helps to build you, simply require your loyalty and benefits as well. Focus on being a team player, you need to play parallel as a player with your colleagues and not as a boss. At the end of the day, the weight of your pocket does matter. So, deliberately focus on ROI. Set high bars for the entrance of employees (at the time of selection or interview) and be vigilant during the course.